Kilmore, a township, is 58 km north of Melbourne on the Northern Highway, formerly the Hume Highway. In 1841 William Rutledge obtained a special survey area of 8 square miles which he named Kilmore, a Gaelic word meaning great church. Rutledge came from County Cavan in Ireland. His special survey was a speculative venture, as subdivided lots were offered for sale in 1843. By then a private Kilmore township had been surveyed at the south-east corner of the survey area, and the Kilmore Inn had been opened for travellers. The inn was ideally positioned, as the road from Melbourne to Sydney passed through the Kilmore gap in the Dividing Range. The gap is reached after a prolonged climb up the Pretty Sally hill, 4 km north of Wallan. The soil at Kilmore is of a good depth and of volcanic origin. Farms grew wheat for the Melbourne market and enjoyed a brief expansion for the gold rush population of the early 1850s before farmers and labourers decamped for the diggings. In 1851 Kilmore had a population of 2064 people. Anglican and Catholic schools were opened in 1850, and a Free Church of Scotland school in 1852. By 1856, as the gold rushes waned, Kilmore underwent consolidation: an agricultural society was formed, a mechanics’ institute was built and a borough council was created. 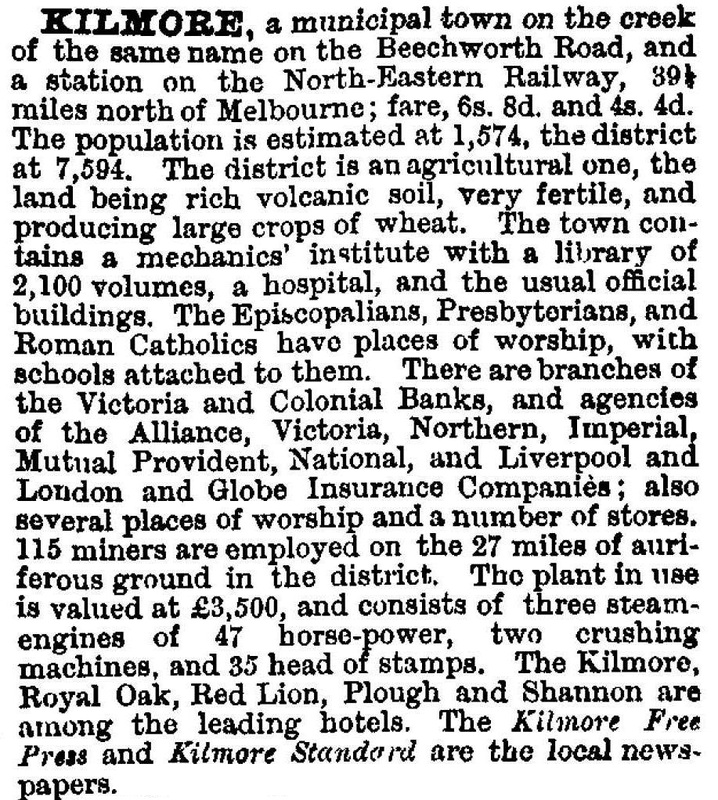 In 1874 the borough was united with adjoining road districts (Bylands and Willowmavin) to form Kilmore shire. 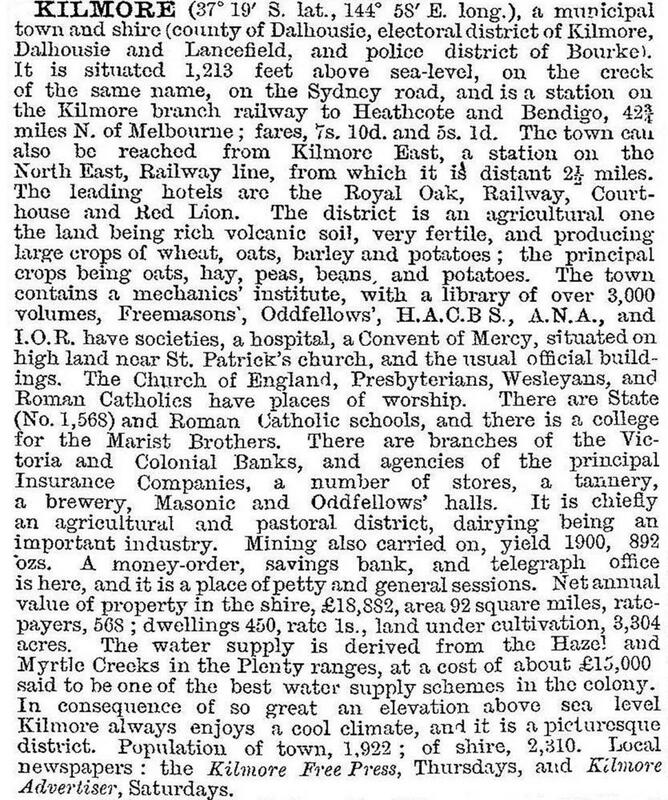 By then Kilmore also had a hospital (1860), and a railway line from Melbourne to Seymour passed through Kilmore East. The line was separated from Kilmore by a narrow but hilly range, and no connecting branch ever joined the two; Kilmore East, however, did not overtake Kilmore, as happened with some other places which had railway stations located out of town. Kilmore grew to become an Irish-Catholic township. This did not flow from Rutledge’s origins, as he was Irish Protestant. Rather, it came from the settlement of small farmers and working-class townspeople. In 1893 a Catholic boys’ school was opened, becoming Assumption College in 1901. The College, conducted by the Marist Brothers, has become Kilmore’s notable landmark on the western side of the town. It became co-educational in 1971 and has taken boarders from as far afield as King Island. The College has a strong tradition in sport, particularly Australian Rules football. Despite Kilmore’s situation as a transport node the township underwent decline during World War I. The shire council was ruled by rural interests and the township was kept as a pleasant but static backwater. After World War II there was minor urban growth. Secondary schools were located at Broadford and Seymour which was a disincentive for residential settlement in Kilmore. In 1959 the first section of the Hume Freeway was opened, bypassing Kilmore. Ironically the Council, influenced by modernity, required the removal of shopfront veranda posts because of their perceived hazard to traffic. The streetscape was transformed. During the 1960s-70s some of Kilmore’s farms were subdivided for rural/residential holdings, and the acreage prices brought fresh local income. Horse-breeding and training invigorated the turf club and a new trotting club, and the Kilmore track outranked the Seymour venue in some respects. Kilmore has a industrial estate, hotels and motels, a golf course, racecourse, swimming pool and other sporting facilities, a hospital and a nursing home. There are four churches, including the heritage listed St Patrick’s (1860), State and Catholic primary schools and Assumption College. Registered historic buildings include the former town hall (1894), the court house (1863), the hospital (1859), the post office (1861) and four residences. The most important is Whitburgh cottage (1857), the home of the museum. The Kilmore primary school had 437 pupils in 2014. The Northern Highway is a narrow thoroughfare through the middle of Kilmore. It is busy and noisy. Residents have campaigned for a bypass for many years. In 2013 the State Government offered three bypass options. They affected dozens of properties, and/or were predicted not to be very effective, or were too costly. In 2013 Victoria’s state planning minister released a planning blueprint that signaled population and employment growth in rural towns including Kilmore. In 1955 Beveridge and Wallan were added to the shire and by the late 1950s the shire had an area of 509 sq km. 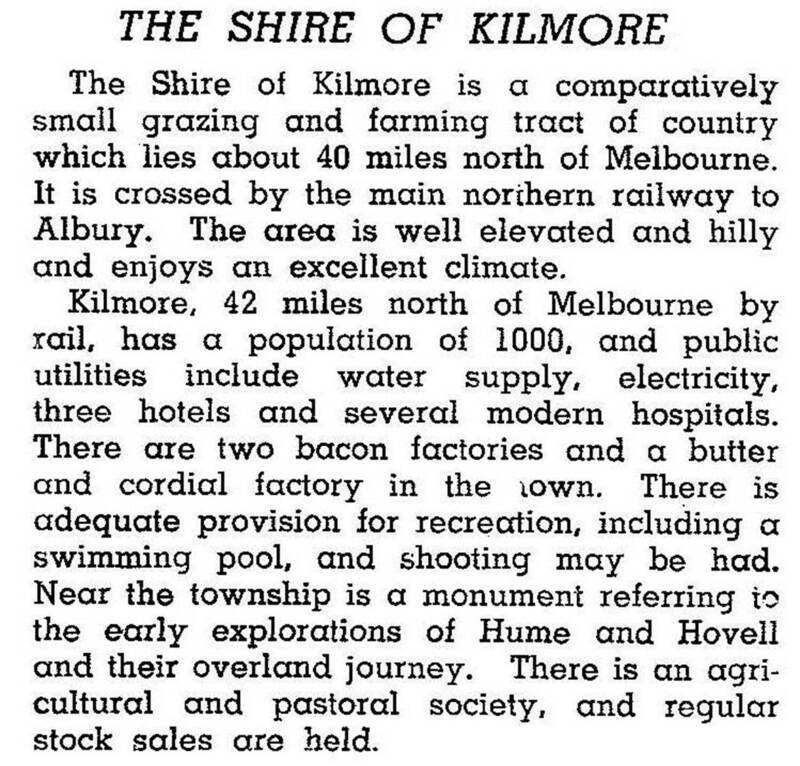 For most of that period, and until 1971, Kilmore township had about half the shire’s population. Beveridge and Wandong were wayside villages and Wallan was the only other town in the shire. By 1986 it had under 30%, as Wallan and rural/residential living outside Kilmore added to the shire’s population. The shire’s livestock numbers fell by one third during 1970-90. In 1994 there were 50,000 sheep and lambs and 10,400 cattle on the shire’s farmlands, which were 52% of the shire’s area. On 18 November 1994, Kilmore shire was united with most of Seymour rural city, Pyalong shire and most of Broadford and McIvor shires to form Mitchell shire. * Wallan district transferred from Broadmeadows shire to Kilmore shire in 1955. Kilmore East, where the railway station is located, has a village street layout and a census area extending eastwards across the ranges to the Hume Freeway. The census area had 353 residents in 2011. The giant Kilmore East bushfire, found to have been started by an ageing SP Ausnet power line, resulted in the Black Saturday fires that killed 173 people and destroyed thousands of homes in 2009. Bushfire again threathened Kilmore in 2014.